Presenting the revolutionary...Egg Storage Container! This brilliant, sure-to-win-the-Nobel-prize device is designed to hold your eggs in place while they sit in your icebox refrigerator. Simply go out to the barn (where everyone in NYC gets their eggs), gather them up in your apron and bring them home, where they'll find a nice, cozy home in this convenient storage container. It's not like you can go to some store and buy a dozen eggs already packaged for you. Some day, though. You'll see. 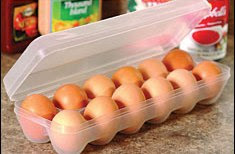 How in the world does this piece of crap prevent "a dozen eggs taking over your refrigerator" any better than those dreaded "flimsy paper cartons" (which are the same size as the plastic container shown in the photo)? And contrary to this puffery, most cardboard egg cartons today are much stronger than this 99-store-grade plastic. And, the cardboard ones are recyclable. Unlike this useless crap that will end up as garbage when the top breaks off and the plastic starts cracking after the 5th or 6th use.